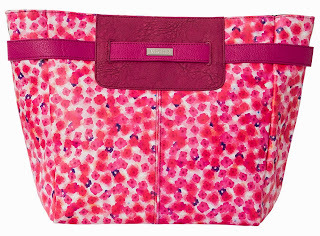 Is there anything more feminine than a bright floral print? The Rosa Demi Shell features a totally unique custom print in shades of berry, with just a touch of navy, on a white faux leather background. Berry piecing and strap detail tie it all together. Rectangle bottom; silver hardware; back zippered pocket.